Kabbalah Wizards and Christian Zionists Trying to Build a Third Temple | Have Ye Not Read? 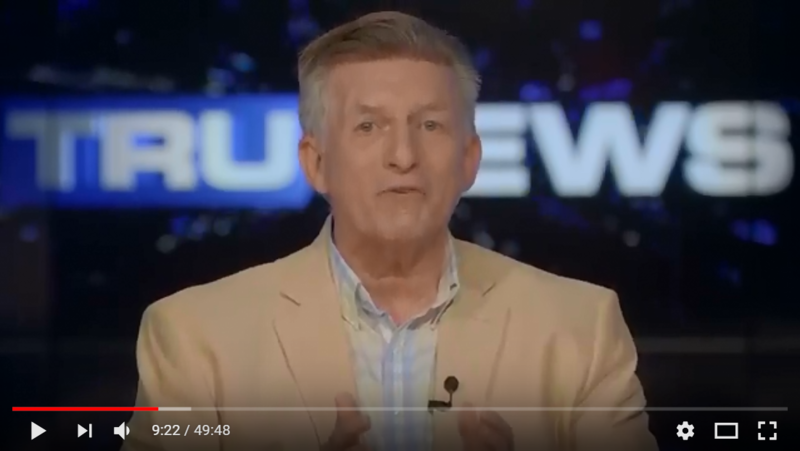 It’s important to note that Rick Wiles, pictured above from the video teaching we’ll be discussing in this commentary, formerly worked for Christian Broadcasting Network as well as Trinity Broadcasting Network, the two top evangelical Christian broadcasting networks. But he says he no longer has anything to do with the major Christian broadcasters due to their all-too-close associations with what he correctly calls the “Kabbalah Wizards” of Jerusalem. In other words, he’s found that many of the big-name Christian leaders are so wrapped up with Zionist Jews who take their teachings from the mystical book of the Kabbalah (which teaches Jewish ritual magick and mysticism), and the Talmud (which teaches that Jesus is boiling in hell in hot excrement), that these “Christian” evangelical leaders are virtually more “Jew” than they are Christian. In the 49-minute video at the link above, Rick discusses the very serious heresy (and blasphemy) involved in supporting the efforts of Zionist Jews to have a “Third Temple” built in Jerusalem. He and his guests rightly point out that Christian support for a so-called “Third Temple” is one of the ultimate blasphemies, because it negates Jesus Christ as THE Living Temple of God, and it negates Christians as the “living stones” that make up that temple, which is also known as the many-membered body of Christ. In other words, for evangelical Christian leaders to believe in the need for a “Third Temple,” they have to reject the New Testament which teaches us that faithful Christians already are that temple, in Christ. In other words, the Kabbalah is basically a book of Jewish mysticism, magick spells, enchantments, man-made numerology and other esoteric and occult practices that the orthodox rabbis use in the course of their daily lives. I’m talking about things like swinging chickens over their heads for the forgiveness of their sins (yes, they really do such a thing; see here, here, and here). And he explains why this is such a serious blasphemy that he can no longer have anything to do with such “Christian” leaders. Indeed, he says he’ll no longer allow these Christian leaders on his broadcasts, neither will have any kind of fellowship with them. God won’t receive you into His eternal family household if you’re acting in concert with, and supporting, the Christ-hating Jews. In God’s eyes, it’s the equivalent of touching “the unclean thing,” which refers to the sin of Achan in Joshua chapter 7, and is a Hebraism for committing gross idolatry. As you might remember, Achan, a Judahite, hid a Baal priest’s robe and other forbidden idolatrous items in his tent. And because of it, God wouldn’t allow Israel to prevail in battle against the Amorites until the “accursed thing” was removed from the camp, and Achan was put to death for harboring it. That’s how seriously God takes our religious affiliation and participation with those who hate Christ. He despises it as much as He despises the idolatry of Achan, because such ties always lead to idolatry. In other words, God won’t bless Christianity, because, like Achan of old, Christianity has strayed so far from God and His Word — even straying directly into the camp of the Christ-hating Kabbalist Jews and embracing their blasphemous “Third Temple” mania. Again, it’s we, as Christians, who make up the temple of God. Not some brick and mortar building in Jerusalem, or anywhere else for that matter. The temple of God is composed of living people who love the Lord and who serve Him faithfully. And if we don’t believe that..if we believe instead that a mere building is the temple of these end days…then we can’t really call ourselves Christian, can we? And He did exactly that. He rose from the dead three days after His death, and the building of the temple known as the many-membered body of Christ began at that point and has been carried on from that point forward. It’s a temple composed of “lively stones” (I Peter 2:5) which means “living stones,” which in turn means it’s composed of you and me and all other faithful Christians. We’re the bricks that make up the temple walls — the temple of God in Jesus Christ. And that means Christian support for the building a so-called “Third Temple” in Jerusalem is a blatant rejection of Jesus Christ as our temple head and of faithful Christians as the temple body. In short, it’s a rejection of God’s Word. And therefore, it’s no wonder Christianity in America is now in such a steep decline. “I don’t know how anybody can ignore the bizarre religious alliance between Israeli Kabbalah wizards and American evangelical church leaders. Apostate American evangelicals are in a weird marriage with Satanic Kabbalah mystics in Israel. On top of it, both are claiming that President Trump’s name is identified in Bible prophesy through numerology. “President Trump’s decision to move the U.S. embassy [to Jerusalem] set off a new wave of Third Temple mania among American Christian Zionists. In their quest to make John Nelson Darby’s flawed prophesy predictions come true, the building of a Third Temple is now their next big goal to accomplish. We have plenty of evidence today to back our claims that Kabbalah wizards are working with American Christian Zionists to use President Trump to build a Third Temple in Jerusalem. But “divinely sent” by who? After all, the god of the Kabbalah wizards is not Jesus Christ. They openly reject Jesus. Instead, their god is Satan himself. I’ve said it before. And I’ll say it again: If you want to take your teachings from Christ-hating Jews, then fine. Go right ahead. But don’t expect God to bless you for it, because He considers it one of the worst forms of blasphemy. You’re eating, symbolically, at the table of the antichrist when you do such a thing. And in so doing you’re rejecting — however unwittingly — the communion table of Christ, which is the communion of a single body, not some hybrid so-called “Judeo-Christian” body. After all, you can’t be both “Judeo” (i.e., a rejecter of Christ) and “Christian” (i.e., a faithful embracer of Christ) at the same time. It just won’t fly. It’s double-minded. In supporting the building of a so-called “Third Temple,” Christians are essentially allowing the Kabbalists to cast their sensationalistic and deceptive spell over them by falling for their fake “prophesies” and predictions that emanate not from the Word of God, but from their esoteric interpretations of the Kabbalah and the Talmud. To be very frank with you, until yesterday I’d never heard of Rick Wiles. But I can tell you that, for me, it’s very heartening to see an American Christian leader who has worked for decades with the big evangelical broadcasters come out from the deception and begin to teach so boldly and decisively against it. That’s why I urge you to listen to the video at the link above. I think you’ll be pleasantly surprised, as well, to see mainstream evangelical Christians coming out of the deception and boldly urging their fellow Christian evangelical leaders to do the same. This commentary, by the way, is not an endorsement of Rick Wiles. I simply haven’t had time to listen to his other teachings in order to draw any kind of conclusion as to the veracity of his teachings. Even in the 49-minute video I’ve linked to at the top of this page, he has stated a few minor things I disagree with. But as the old saying goes, we can disagree without being disagreeable. And we must always remember that everyone comes to the truth in fits and starts, meaning, it takes time to grasp, in its fullness, the wickedness going on in this world today, because you’re having to “see” through so much deeply entrenched deception. Rick Wiles appears to be seeing through the deception that most Christians today have fallen for. And for that I applaud his bravery in reporting on what he’s seeing.